Daryle Kitamori, General Manager of the Hilo Hawaiian Hotel, has confirmed that after 20 years of foreign and off-island ownership, the hotel has been sold for $17.3 million by CarVal Investors to a local hui put together by Castle Resorts & Hotels. Castle Resorts & Hotels has managed the Hilo Hawaiian Hotel for over 20 years as part of Castle’s broad portfolio of resort accommodations ranging from full service hotels to spacious beachfront resort condominiums on five islands in Hawaii, as well as in Micronesia and New Zealand. Castle will continue managing the Hilo Hawaiian under a multi-year management agreement and has stated the sale will have no impact on the current operations of the hotel. The Hilo Hawaiian has long been a popular hotel for visitors and kama’aina, and is the highest rated, oceanfront, full-service hotel in Hilo, Hawaii. Kitamori and his team have been credited with the prestigious “Best East Hawaii Hotel” and “Best Meeting and Banquet Facilities” awards by readers of the Hawaii Tribune-Herald. 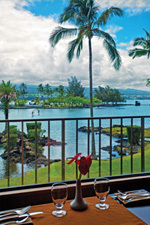 During the recent renovation of the Queen’s Court Restaurant, the dining room was configured to further enhance the impressive panoramic view of Hilo Bay enjoyed by guests. Acknowledging Hilo’s role in the history of hula and site of the renowned Hilo Merrie Monarch Festival, the restaurant features an extensive display of wall hangings depicting hula dancers and other representations of Hawaiiana.